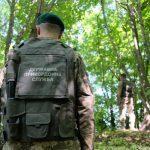 Considering operative information, the border guards of Lutsk and Chop Departments detained two illegal immigrants nearby the state border. The citizens of Afghanistan and Kazakhstan intended to cross the state border of Ukraine outside the checkpoints. The regular bus “Kyiv – Hanover (Germany)” arrived last night at the checkpoint “Krakovets” at the border on Poland. At the time of passengers’ registration, the military staff of Mostyskyi Detachment found two citizens of Turkey, who presented forged passport documents of the citizens of Bulgaria for control. The notification as to the foreigners was sent National Police about detection of the signs of criminal offense under the Article 358 of the Crime Code of Ukraine “Forgery of documents, seals, stamps and forms, their sale, use of forged documents”. The signs of border crossing were not detected. The foreigners were taken to the border units to clarify the circumstances of the offense and draw up the administrative reports under the Part 1 Article 204-1 of the AICU. This entry was posted in Translated Media-News from Ukraine on May 6, 2018 by oksana.